Big Fat Catholic Book Review! And RIGHT before Lent! See how nice I am? These are all books I purchased at the Catholic Women’s Conference last weekend. I haven’t read all of them yet, but for the ones I have read, book reviews are there! Therese, Faustina and Bernadette: Three Saints Who Challenged My Faith, Gave Me Hope, and Taught Me How To Love, by Elizabeth Ficocelli. There are several books by Ficocelli in this list (all following this one), for the big reason that I used to go to the same parish and often watched her kids in the nursery or at church functions. 🙂 She’s a really lovely woman with a great family, and she’s also a rather prolific writer. This is her newest book. I haven’t read it yet, but the conference’s emphasis on St. Faustina and Divine Mercy made it a “must pick up” for me. The Child’s Guide to the Seven Sacraments and The Child’s Guide to the Rosary: I bought these books for my first grade CCD class, since these are things we definitely talk about during the year. They are beautifully illustrated and the text is first rate. The Fruits of Medjugorje: Stories of True and Lasting Conversion: This book is made up of individual stories, the chapters broken down by themes. Ficocelli compiled the stories and wrote a foreword. If you’re interested in Medjugorje, this is a good book for you. Mass Start: Toeing the Line for Faith, Family and Fitness with U.S. Olympian Rebecca Dussault, by Bill Howard. This book just came out, and there’s not an Amazon link for it, so this link takes you to her personal website. Mass Start is what happens at the beginning of a race ( everyone crowding at the starting line), but Dussault also calls her new website Mass start, because the Mass is really the start of our faith, right? Everything builds from that. The book is a biography of Dussault, who spoke at the conference, and is well-written and includes a great color photo inset. Dussault has a compelling story and infectious enthusiasm, and you will too after reading the book. God’s Bucket List: Heaven’s Surefire Ways to Happiness in This Life and Beyond, by Teresa Tomeo. Tomeo’s first book Extreme Makeover, is a must-read for all Catholic women. This is her second book following that one. I enjoy Tomeo’s conversational writing style, but I think I should note that this is pretty basic stuff she’s talking about–being still to be able to listen to God, prayer, reading the Bible. It’s not that I didn’t like it, it’s that I wanted more from the book, sort of something a bit more abstract. The other books I purchased, but haven’t read yet, are Seven Secrets of Confession by Vinny Flynn; Happy Are You Poor: The Simple Life and Spiritual Freedom by Father Thomas Dubay (who also wrote the excellent Prayer Primer and Deep Conversion/Deep Prayer), and St. Faustina’s Diary, which I’m currently reading. I’ve been doing a “Bible passage a day” on faithlife, and this was today’s selection. Yeah, I needed that today! Shamless promotion: Last post in the Lent series went up today. If you missed the earlier ones, you can read the entire series here. Lent starts on Wednesday, so get thy plan in gear! So, as we know from the post that went up today (yes, I’m making you all read it, bwahahah! ), my Lent has basically been decided for me, with GI tests, rehab, and med changes, but I have some plans of my own. I can’t entirely abandon facebook, because people will want medical updates, so I’ll still be there, but it’ll be limited. I’m going to switch my lectio divina from the OT to the NT, starting with the Gospel of Matthew. Of course being dedicated to my office and going to Daily Mass as often as possible are givens. With all the waiting for my tests, I’ll be able to get a good chunk of reading done. And I’ve also given up book buying, so I’ll be reading only the books I have–in “real” or “e” form–already on March 5. Anyone else using Verbum software? Any tips or tricks? I love how many books are in the library (I have foundations). Just reading Bl. John Paul II’s encyclicals will keep me busy for a good long while, and I’m also using their Lenten devotional plan. 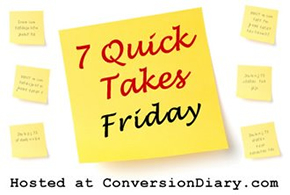 While we’re on the topic (sort of), here are some of my favorite Lenten resources: Magnificat’s Lenten companion; Death on a Friday Afternoon by Fr. Richard John Neuhaus; B XVI’s Way of the Cross Meditations. For additional Lenten reflection this year, you can also read the Pope’s Message for Lent 2014. What I’m reading right now, incidentally: City of God, St. Faustina’s Diary, An Echo In the Bone, Pickwick, and Therese, Faustina and Bernadette. A real emphasis was placed on the Divine Mercy devotions and chaplet at the Women’s Retreat last weekend, so I’ve been inspired to delve back into it. After Mass, we had breakfast. Our first speaker was Sr. Miriam James, SOLT, who gave a talk that had just about everyone in the audience in tears (showing Anne Hathaway singing “I Dreamed A Dream” didn’t stop them, for sure). She talked about the “holy longing, holy desire” that we have for God, and our desire to be seen and noticed by the one who loves us. Part of desire is stretching, wanting to desire God Himself, who wants to fill us with Himself. A woman’s body and spirit reveal God to the world and emphasis receptivity, openness, and grace. The beauty of body and soul speaks to the longing for eternal beauty that everyone desires. A woman’s attentiveness to the person, recognizing the inidivudla, intuitiveness, nurturing spirit and being the guardian and bearer of life make the world more humane–more fully human. Sister spoke about the toxicity of culture, and that outré mission to authenticity is to love and be loved. Christ wants to touch us and heal us, if we let him. A priest spoke about Divine Mercy and the Sacrament of Confession, leading to so many ladies lining up for confessions. Forty priests were on hand to hear them! I got lunch and did some more book shopping, because we have abundant confession at my parish, so I didn’t want to deny someone who may not have it a chance to go. After lunch, Kimberly Hahn took the stage. She spoke about the Proverbs 31 woman, and how we can work those qualities into our lives by being Godly, a woman of excellent, a woman who feast the Lord. To fear the Lord means to have reverence and awe for the God of the Universe who is our Father (I loved this definition.) This fear leads us to a faithful and faith-filled relationship with Him. God lavishes His love on us–we are His beloved daughters! We must hope in His steadfast love, because He made us, and bought us back–we are His twice. Kimberly encouraged us to let Jesus reside in our hearts, and to pursue purity and holiness, and know that God delights in each one of us. At 3:00, we said the Divine Mercy chaplet, and a period of adoration was offered, but, to me, was marred by overenthusiastic singers who wanted us to “participate” instead of praying in silence before the Monstrance. So I left around 3:30. There’s a story I read somewhere about St. Teresa of Avila. One year for Lent, she had an amazing plan–penances, mortification, all these things she was going to do. She ended up getting sick for all of Lent, and her sisters had to wait on her, as she was confined to her bed. Right now, St. Teresa and I are kindred spirits. I started this series before I had my regular doctor’s appointment on Monday. Before that, I had planned to give up book buying, as well as Facebook, for Lent, and really focus on my writing, my prayer life, and things of that nature. Then I had my doctor’s appointment, and my Lent became crammed with GI tests, Pulmonary Rehab dates, and possibly surgery (but we won’t know about that until after the GI tests). So my Lent, so to speak, has been determined for me. I am used to this stuff. I am. I know how a doctor’s appointment can make the world go titled and suddenly everything you had so neatly written in the planner goes out the office window. I should be used to this by now. But I’m not. I wonder if you ever get used to it? I have some time before all this starts. The GI testing takes place on March 17–St. Patrick’s day, so the patronal feast day of my parish–and pulmonary rehab starts the say day. Pulmonary rehab is basically exercise with physical therapists, to increase stamina and lung function and show you what sort of program works for you. Generally the sessions included cardio, weights, and stretching/flexibility exercises. There’s also some other components, like Occupational Therapy (if you need it), there’s a psychologist who works with the team, and a dietician. So between me and all these people, we should come up with some sort of plan to get my ridiculous slackerly body into shape. I’ve always been an “indoor” girl. My brother runs marathons, my sister played tennis for Capital, but I….read. And sing and act and write and shop and travel. I don’t run for fun. Working out, to me, is not pleasurable. It doesn’t given me a runner’s high. I don’t lose weight. I don’t generally like it. But now I sort of have to like it. Or at least tolerate it. But now it’s time to really talk about it. 🙂 Get excited. The offices (except for compline, which is the shortest office) are made up of: an opening hymn, three psalms or canticles (the canticles can be from the Old or New Testament), a short reading, a responsory, another canticle (morning prayer has the Canticle of Zacheriah, from Luke; evening prayer is Mary’s Magnificat), petitions, the Our Father, and a closing prayer. The breviary has this all written out for you, so you just follow along when you’re praying it. OK, the third pillar of Lent (the other two are prayer and fasting/abstinence): Almsgiving. Anyway: Almsgiving. Alms is defined as: charity, or something (as money or food) given freely to relieve the poor. Some churches have poor boxes in the back for this purpose (mine does). Other have special collections for the poor throughout the year. But during Lent, we should definitely be thinking about the poor, and how to relieve their poverty. So some increase in charitable giving is to be considered. There are lots of ways to do this: donate to a food pantry, work in a soup kitchen, pick something from a charity’s gift catalog (like World vision or other such), sponsor a child who lives in a poor nation, participate in Operation Rice Bowl, or donate to your diocese’s ministries for the poor. There are so many ways you can participate in almsgiving. We might not think we can make a difference with our few dollars that we can donate. But we can. A $20 (that’s a ticket to the movies and snacks, or a dinner out, or–for me–a hardback book, or a DVD/Blu-ray) donation to a clean water fund can save lives. Like I said above, there are so many worthy places out there to give your money–this Lent, think about it. Think about the incredibly poverty that exists in our world, and do what we can to help alleviate it. Anyone who’s been in any Catholic church notices them–the Stations of the Cross. Sometimes done in plaster molding, sometimes in steel and wood, sometimes on plaques, sometimes in bas-relief–they are always there, in every church, a gift of St. Francis to the Church. The Stations of the Cross are always there, but seem to gain popularity during Lent, with many parishes offering communal services to pray the stations. As a child, we “did” the stations of the cross every Friday during Lent with our class at the parochial school I attended, every year. 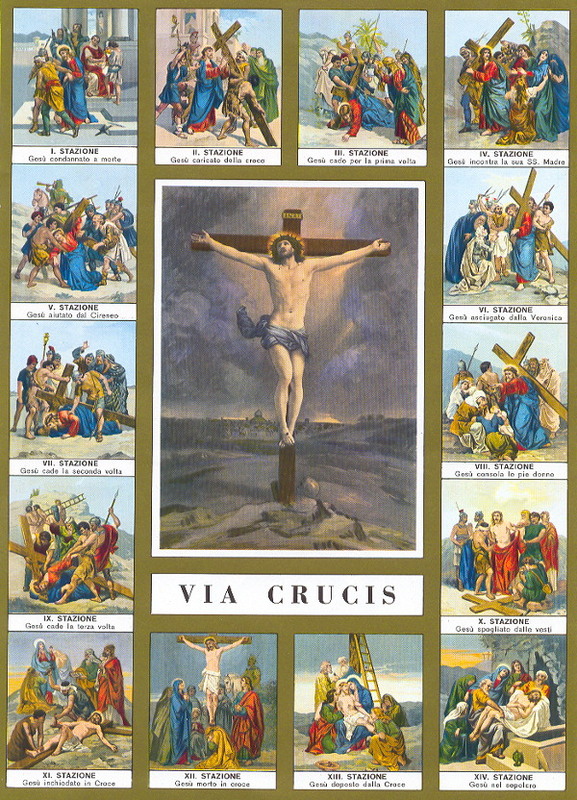 The Stations recount Jesus’ journey to His crucifixion, from His condemnation by Pilate (the first station) to the burial in the tomb (the fourteenth, and last, station). While the number of stations varied over the years, St. Francis codified the stations, in a sense, and gave us the fourteen stations we see today. The object of the stations is to travel, spiritually, to Jerusalem, and thus walk with Jesus on Good Friday, often with a spirit of penance and reparation for our sins. Often in communal services, the hymn Stabat Mater (“At the cross her station keeping”) is sung. On Good Friday, the pope recites the Stations of the Cross at the Roman Colosseum, complete with prayers and meditations. An excellent set for meditation are these, written by (then) Cardinal Joseph Ratzinger, before Bl. John Paul II died in 2005; the pope was too ill to complete his normal Good Friday practices, so the Cardinal took his place, writing his own series of prayers and reflections. The stations are a superb Lenten practice, since the graces we receive from doing them in a spirit of prayerful recollection and penance are so immense. It is good for us to ponder these things, to realize why Jesus died, to see the supreme mercy of God–the extreme depth of God’s love for us. We all see the signs that say John 3:16: “For God so loved the world that He gave His only Son, that whoever believes in Him shall not perish, but have everlasting life.” By mediating on the stations of the cross, we can truly see that love–love that was so deep it sustained Jesus through His horrible torture and death.